Anytime my friend. You are very welcome. Last time when I was in Paris, it was my birthday ! 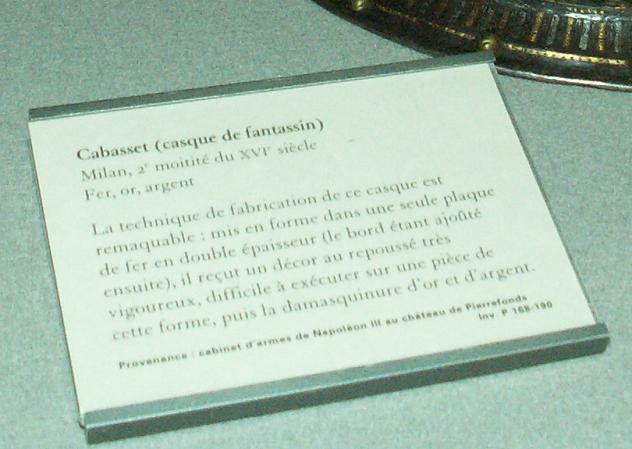 And I ended up taking pictures in Luvre and Musée du Armée the whole day. 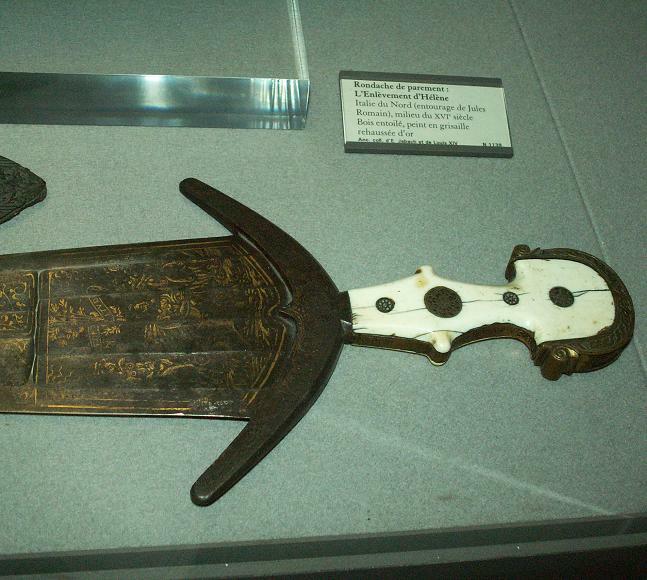 The relief workof the scabbard reminds me of Persian shamshir scabbards . That is very impressive! Seeing something that intricate reminds me once again that whoever thinks old = crude definitely needs to get knocked in the noggin, yet every day on ebay the unscrupulous sell thousands of "old" crude items with the idea that in "ye olden days" people did not know how to do quality work. Manouchehr: Thanks again for the pics I really love cinquedeas. I might get the cheap(er) Windlass antique one at Kult of Athena soon but might just consider a custom version as some point. to width of blades ? Thank you for your input Jean. I also love them. They are truly beautiful. I do not have that book. Where can I buy a copy? 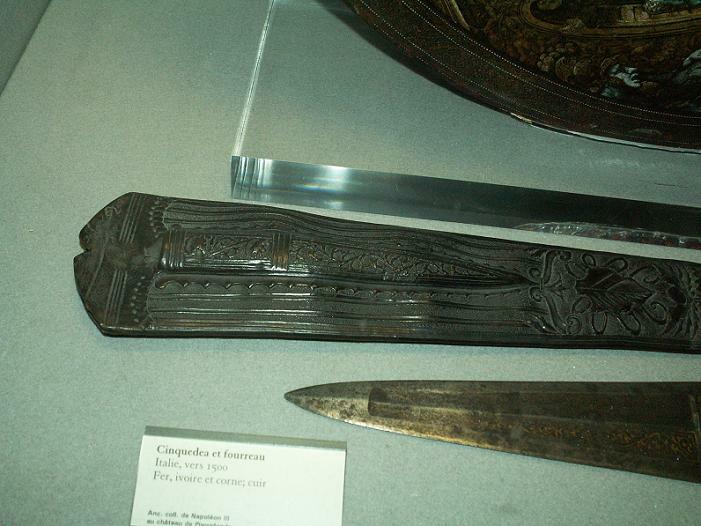 VERY nice to see a sheath for a Cinqueda! Something that I have never seen, actually. Lots of suppositions, but no actual artifacts, so thank you for posting that. Now to tell a friend who wants to actually make a PROPER sheath for his! Very welcome. 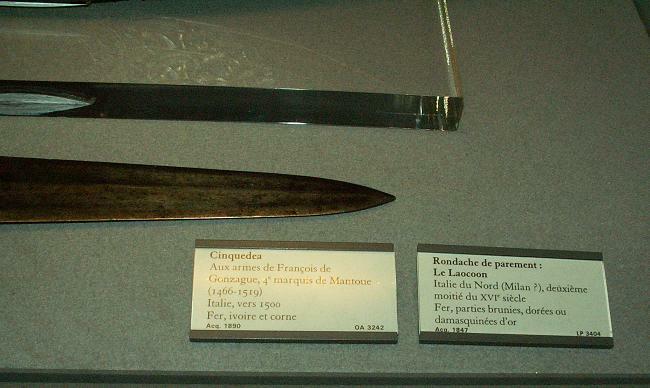 I posted another cinqueda with the sheath in the thread on Musée d'l armée. Have you seen that? I think there is an English version of the book also in existence. Very much worth it if you can find one. 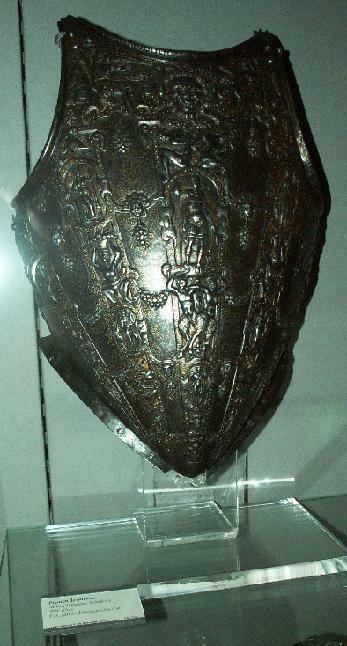 I bought mine some time soon after it's first printing and there are great drawings of armour copied from tomb funerary sculptures that may no longer physically exist ( Damaged in war or by pollution ). Can I get the book in its original version somewhere? 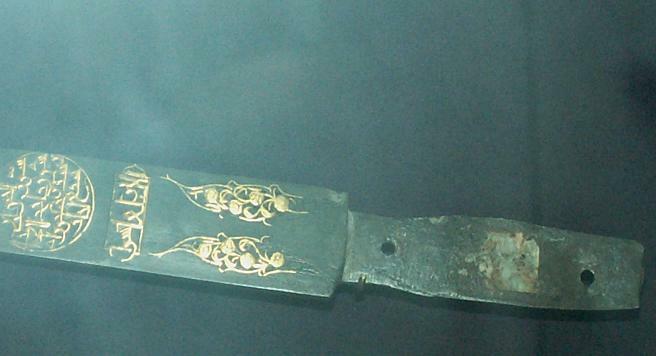 The next swords are magnifiecnt and with very important inscriptions. Unfortunately the rookm was very dark and above all the glass was very thick. 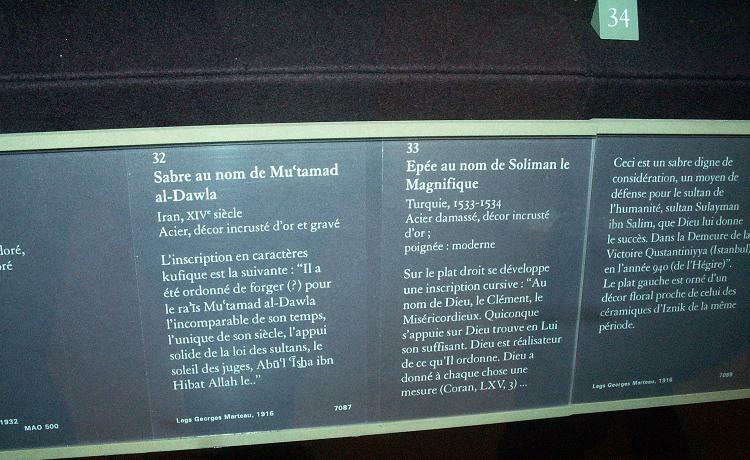 "This has been ordered to forge by the king Mu'tamad al-Dawla, the incomparable in his time, the unique in his century, the support of the law of Sultans, the sun of justice, Abu'l Isha Ibn Hibat Allah le . 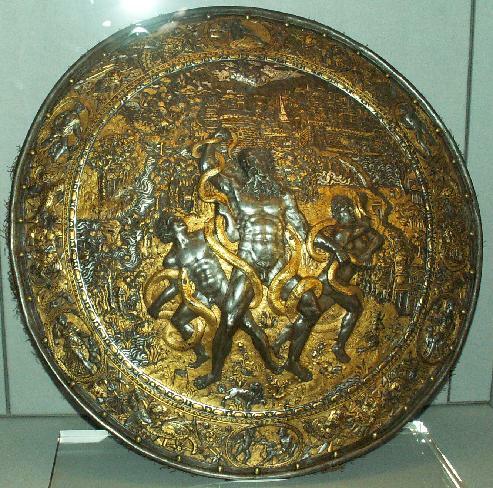 . . "
Yes that is a beautiful shield. Now look at this one. Breathtaking beauty. 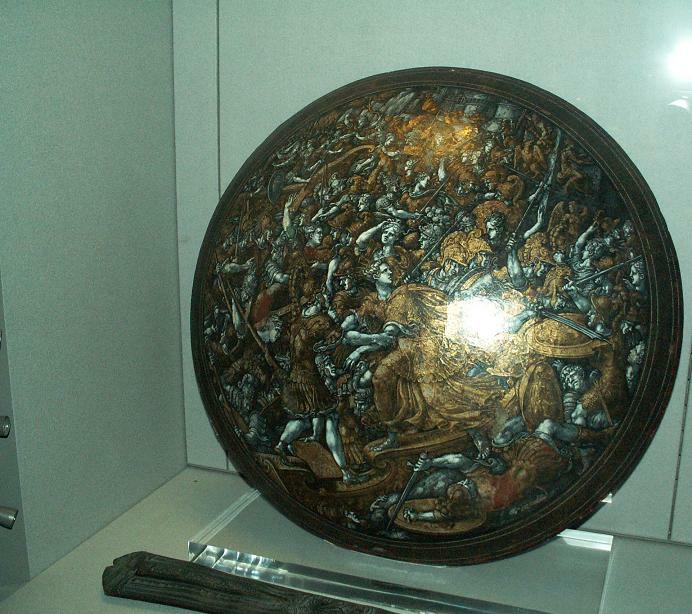 Let us continue our virtual tour in Louvre. 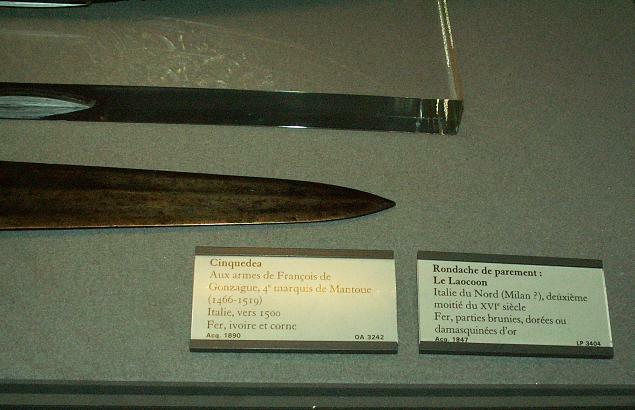 I was perusing through my pictures archive, and found the attached shots of the cinquedeas that Manouchehr posted earlier in this thread. Since the angles are slightly different, I thought that they might be of interest. Great pics and I love the aesthetics of cinquedea(s) but I can't help obsessing about how narrow the tangs look at the guard. How are these built ? A narrow tang or something closer to a full tang: Admittedly very narrow close to the guard. I would guess tang thickness could compensate for some narrowness ? 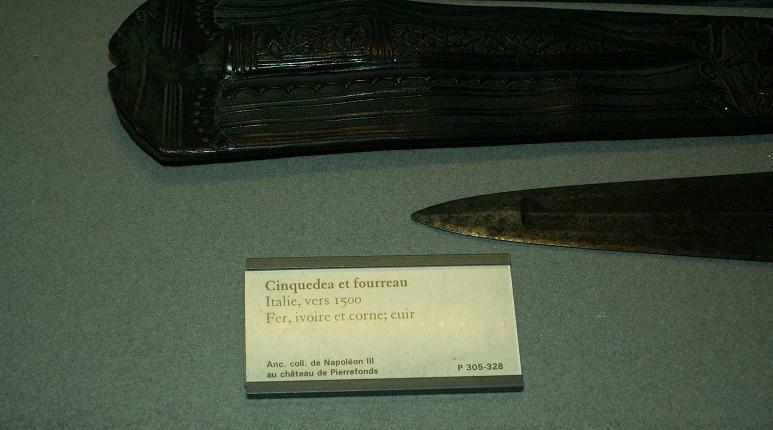 I've never read any detailed explanations on how cinquedea handles are put together: Most museum or book descriptions of arms usually favour an art history approach and rarely the practical design approach i.e. the why and how things were put together and using " martial art " aspects. Funny enough, I'm a descendant as well, so I guess we're related at some point. Which son are you descended from? I believe I am descended through Louis and then Lothaire. 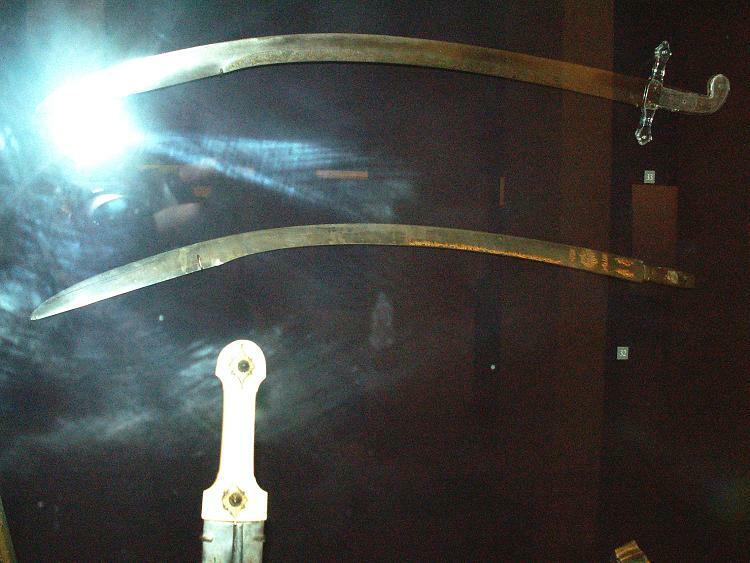 Anyway, to get back on topic, nice shots of his sword, that glass case frustrated me to no end in trying to get shots of it while I was there, nice job and thanks! Jean : I've not ben able so far to document closely (holding it in my hands) a cinquedea - but I spent some time gazing through the glass. Cinquedeas grips and hilts ar a complicated matter. At first, you'd think they're of scale tang type, but a closer look reveals they're whittle-tanged, sort of. The tang goes all the way through, to the end cap (can't call it a pommel), the latter being often screwed on. The rivets are mainly - and extremely - decorative, of complicated 'mosaic' type. 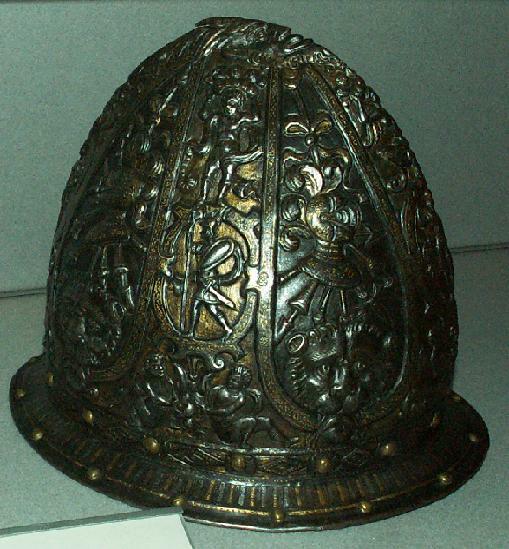 The scales are made broader than the tang, so there is a kind of space between them, in whch is placed, but slightly recessed, a brass/golden metal band inscribed (engraved or etched) with a motto or something similar. You're right in guessing that the tang is pretty thick, actually. Cross guards are far from simple too. Anyway, I'll try to dig out a pic or two of these 'deas, and post it here or start a new thread. Remind me of that in, say, 2 weeks (PM me), as I'll certainly be too busy until then.